Characteristics: Large, dark green obovate leaves in a dense and compact shrub. Growth & Spread: Medium rate grower. Height from 1.0 m to 1.3 m. And a Spread which is similar 1.0 to 1.5, but the plant often tends to be wider than taller. Flourishing Season: Bright pink lacecap flowerheads bloom in mid to late summer. Water & Maintenance: Regular watering required. 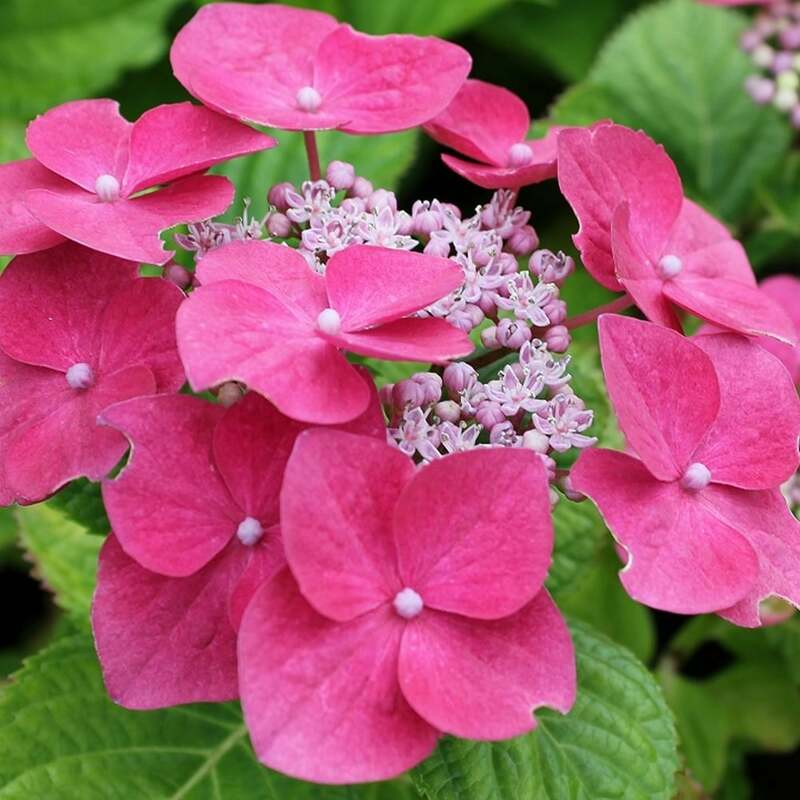 Prefers more alkaline soils to produce bright pink-coloured flower. Hydrangeas need moist and well-draining soils. Also known as “Taube”, the “Teller Pink” is a wonderful addition to any garden with its highly decorative flowers. Similar to the “Teller Blue”, this varietal has large, lacecap flowers, with a centre of fertile florets, surrounded by more decorative, sterile flowers. These exterior flowers will be a vibrant shade of pink depending on the alkalinity of the soil. Although they can do well in sunny areas, but prefer partially shaded areas. Like most Hydrangeas, they need moist, well-draining soils. So, any areas where they are used, they should be kept well-hydrated, but allowed to breath. Mulch is especially recommended in order to keep the necessary moisture levels. For colder weather concerns, these plants do well in all areas in the UK and can easily tolerate harsh temperatures down to -10⁰ C. If below this, they should be better protected, especially strong and dry winter winds. This plant is salt tolerant and works very well in partially shaded areas for landscaping. The overall rounded and compact features of the plant, along with the beautiful flower arrangements lend themselves well to being a part of mixed flowerbeds or as feature plants in a bed or container.